Capsule Summary: Colonel Potter lashes out after he starts doubting his surgical skills and calls Sidney Freedman for help. Meanwhile, Charles is sick of his dirty Swampmates and decides to turn the tables on them. Last week, I reviewed an episode featuring Sidney Freedman (“Quo Vadis, Captain Chandler?” from Season 4) and today thanks to the random number generator I’m reviewing another episode featuring the 4077th’s favorite psychiatrist. “Pressure Points” was the second-to-last episode to guest star Allan Arbus. He returned for the series finale at the end of Season 11. Like so many episodes of M*A*S*H, this one features a dramatic storyline and a comedic one. The A story in which Colonel Potter uses anger to mask his fear is clearly the dramatic storyline. That makes Charles turning into a slob the comedic B story. Both are enjoyable but neither are perfect. The problem with the Colonel Potter story is the yelling. I don’t know if it was the writing, directing, or Harry Morgan’s acting choice but the yelling is just too much. Potter often got angry and often yelled and sometimes it worked and sometimes it didn’t. When he blows up at Captain Schnelker (“If they can invent better ways to kill each other, why can’t they invent a way to end this stupid war! ?”) it definitely doesn’t work, at least in my opinion. Perhaps there’s a scenario in which Potter’s reaction would’ve worked. The sentiment is fine. The emotion is fine. It’s the motivation that doesn’t ring true. Potter is upset because he missed some shrapnel so he completely blows his top? I don’t buy it. Then he does it again in the Mess Tent when he berates Hawkeye. Like I said, the yelling is too much. Calling in Sidney makes sense. It’s believable that Potter wouldn’t want to talk to any of his subordinates about his fear. Too bad Sidney isn’t given more to do. He doesn’t really help Potter other than to serve as an impartial ear. The story Potter tells about falling in love with surgery after seeing his uncle operate on a colicky horse is touching. The emotion in Potter’s voice is genuine (“I’ve lived that wide-eyed little boy’s dream ever since.”) but also serves to reinforce how overblown the yelling feels. The Charles B story is a good one and I love seeing Charles the slovenly slob, even if the whole thing is somewhat reminiscent of “The Smell of Music” from Season 6. In that episode, Hawkeye and B.J. get so annoyed by Charles and his French Horn that they stop bathing. In “Pressure Points,” Charles gets annoyed at how messy Hawkeye and B.J. are so he stops cleaning up. The best part is how quickly and completely Charles transforms from meticulous neat freak to utter pig. He not only stops cleaning up after B.J. and Hawkeye–he stops cleaning entirely. He also stops shaving and makes a mess while eating. I wonder how much fun Alan Alda, Mike Farrell, and David Ogden Stiers had destroying the Swamp. Also, I feel so sorry for whoever had to clean everything up after production wrapped on this episode. Colonel Potter talks with Sidney. Is there any indication in earlier episodes that Charles actively cleans up after B.J. and Hawkeye? Off the top of my head, I can’t think of any. Judging by the Christmas cards hanging next to Hawkeye’s bunk, this episode takes place around Christmas. It aired in February 1982. Curiously, this episode suggests the doctors at the 4077th have never encountered white phosphorus before. Captain Schnelker indicates China has only started using white phosphorus. Yet the doctors treated phosphorus burns in two earlier episodes: “Divided We Stand” (Season 2) and “Deluge” (Season 4). However, I don’t believe the term white phosphorus was used in either of those episodes. Perhaps it was a different kind of phosphorus. I don’t know why I noticed this, but during Captain Schnelker’s presentation, Hawkeye is leaning against the wooden stand where Colonel Potter usually keeps his saddle. There’s no saddle to be seen. Later, when Klinger rushes in to inform Potter of the destruction of the Swamp, the saddle is back on the stand. I have been deprived of MASH for way too long. I hadn’t seen an episode in, wow. How many years? until AMC just recently began airing them again. I’ve developed a newfound appreciation for one of my all-time favorite shows but AMC is still on the first few seasons with Trapper John, Frank, and Col. Blake. I’ll be able to better weigh in once I’ve seen more episodes to refresh my memory. I do know that in real life, I can put up with a certain amount of stuff. Every day. I have to. No choice. Some days I get bowled over and I still keep on trucking. Occasionally, though, I encounter the straw. The one that breaks the camel’s back. It could be rather insignificant compared to everything else, but I’m feeling the weight that day and one more straw is all it takes. Then everything is too much and I just want to phone it in and go home, except I am home. I don’t mean to sound silly when I say that we do have to remember that it’s just a TV show. Except for the occasional two-parter, they have less than thirty minutes to run at least one somewhat kinda cohesive storyline, deliver some laughs, throw in reminders that these people are in a foreign country practicing mostly meatball surgery because of a war, and they still need to bring us back for next week. It’s such an infinitesimal amount of their lives in the Swamp, the OR, the mess tent, etc. that we get to see. If I were really there in that place doing one of those jobs under those horrific circumstances, I think I’d almost always have one foot dangerously near the edge of the proverbial cliff, if not dangling over it, and the other foot not far behind. Sometimes yelling is the only available option to deal, aside from going over that cliff. Or instead of going over the cliff. I hope this hasn’t been a dreadful bore, or so way off the mark that you’re wondering if you should call Dr. Freedman. A decent episode, but I always found it a bit over the top how messed up Col Potter gets over one slip up. He acts almost like a child thinking it’s the end of the world, when it’s really not that big of a deal. I guess just another example of M*A*S*H running out of ideas after around season 8. Aside from Potter’s monologue about how he first became interested in being a doctor and referencing Joe DiMaggio retiring, this was a rather bland episode. I don’t blame Potter for going off the way he did, though he could’ve done it less publicly. What really sounds contrived is the part where the storyline has to show that Col. Potter is now a confident surgeon. A “shave Major Winchester prize”? What?? Are you kidding me? A why does Charles look concerned when Potter is chosen as the winner? Does he also think that Potter is doubting his abilities? And if so, how did Charles know this? I’ve got my own reasons for finding this episode compelling, and it has nothing to do with the anachronistic use of white phosphorus or the sad, lilting recording of “Tumbling Tumbleweeds” that Col. Potter has playing on the phonograph in his tent (a track later to be used famously in “The Big Lebowski”). 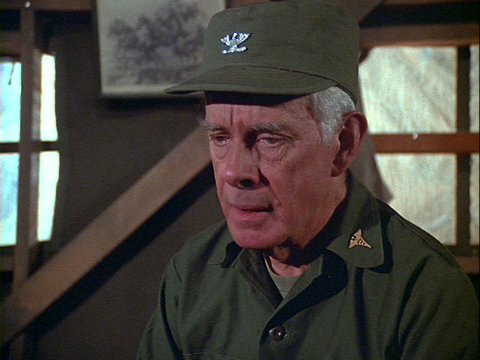 In the only season where Harry Morgan was a cast member, but did not direct an episode, the cinematography of this episode notably amplifies the gravity of Col. Potter’s emotional distress. Allan Arbus’ typically understated empathy counterpoints the tension that was built through the racial conflict in the previous episode with Larry Fishburne, and the season-long wrangles with the Advocate General’s office. I love M*A*S*H* because of my understanding of Shakespeare’s “Hamlet.” The titular character’s “antic disposition” allows him to deal with his family tragedies and political intrigues. In the same way, the tightrope walked by M*A*S*H* contrasts the horror and stark insanity of war with the most ridiculous coping mechanisms imaginable. The weakest episodes lack that balance – either they are just idiotic Klinger-based send-ups, or are over-reaching and overly expressionist Kurosawa tributes. This episode negotiates that balance quite well. On the whole, one of the better episodes of Season 10 in my opinion. All in all a good episode. Always bugs me when people say “oh calm down, it’s just a show.” Really? Then why are we all here posting about it on a MASH site? TV and movies are a big part of our lives, like it or not. We get to know the characters and they invoke feelings in us. The good ones anyway. So it does stand to reason that some of us might analyze it in a bit more detail. Potter obviously snapped which brought up a lot of fears that he had apparently been worrying over. Problem is this is the first we’re hearing of them. Potter is career army which means he’s seen a lot and learned how to deal with a lot during war. The only thing he may not have dealt with was his fear over getting too old to do his job. He does tend to deal with stress by yelling at everyone. It gets annoying but that’s just his way of dealing with it. You would think he would have gotten over the senselessness of war thing a couple wars ago. There’s not much nuance in Potter. He will yell, shed a few tears, and get over it. Why did Charles, Hawk, and BJ start trashing each other’s stuff? It seemed like there was very little impetus beyond making us laugh.